The Old Withy Garden Nursery is in full bloom for another season. 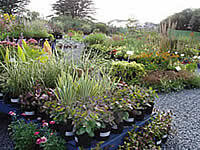 Since the nursery was begun in 1997, husband and wife team, Nick and Sheila Chandler, have gained a reputation for producing a quality range of perennials that are hardy and ready to plant straight into the garden. 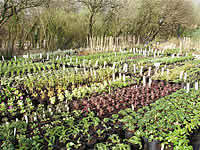 Good garden worthy varieties, both usual and unusual are stocked in alphabetical order on the beds, each pot with a fully descriptive label. Plants which are 'in season' are shown to their best in a colourful area just inside the nursery - ideal for impulse purchases! 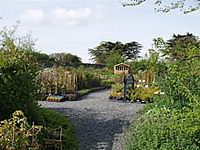 As well as very loyal local customers, who appreciate that plants purchased from The Old Withy Garden Nursery are well established and able to stand up to the windy Cornish climate, the nursery is popular with visitors to the area, who take advantage of the reasonable prices and often return year after year. A descriptive mail order catalogue is available and the carriage is by next day carrier. The Old Withy Garden Nursery is set within pretty display borders, designed to give colour through the year. Especially attractive in the summer is the long border below the car park, planted with Catmints, Gaura, Red Hot Pokers, Achilleas and Day Lilies as well as varieties of grasses. Next door to the nursery is The Grange Fruit Farm, selling fresh fruit grown on the farm and serving delicious light lunches, cream teas, cakes and coffee.